Note: You need to run the version compatible with your system. If you are not sure which version applies to your system download both of them and try to run them. 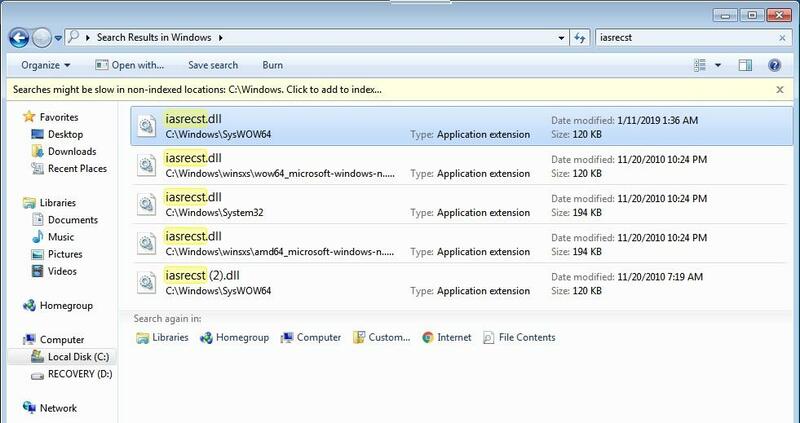 Copy iasrecst.dll into the Search: field in FRST then click the Search Files button. FRST will search your computer for files and when finished it will produce a log Search.txt in the same directory the tool is run. I have Windows 7 64bit & used that version of Farbar. Attached is what you requested. BTY, was the "CBS" I uploaded of any use? As I appear to be suffering from the same malady, I thought I'd add my two pennies; I'll attach my FRST scan for perusal, as I assume JPP and my problem(s) are likely the same - although I've not encountered any problems as of yet after restoring from quarantine, minus 'corruot files' in my scannow. And this one seems healthy. Hello, I recently ran a SFC /SCANNOW and got the dreaded message that windows resource protection found corrupt files but was unable to fix some of them. I checked the CBS log and found that the culprit was the iasrecst.dll file. I came across this thread and saw that Malwarebytes had deemed it a threat so looked in my quarantine and found it there luckily since I don't delete items for safety reasons. I decided to restore the file since it was claimed to be a false positive and I ran the SFC scan again but it still came back as corrupted. This is the entry in the log if that helps. Any thoughts on what I can do to repair this corrupted file or is there any solution to this yet? I really don't want to have to reinstall my entire OS over this. Thanks for any help. can you zip and attach the file located here? I have another computer with the same file and OS and put a good copy of the same file on a flash drive. Should I just replace the corrupt file with the one on my flash drive? I did a system restore the day after all this happened with the false positive with MB lol..just my luck!! I meant my last restore point is the day after I put it in quarantine..so I can't just restore. Anyway I went to add the file and it says replace or copy and I need administrator privileges. Awaiting your response before I continue. Also wondering if you knew what the CBS log meant that I posted as to why it was corrupt. Thanks again. you can do that. The one previously in this thread wasnt actually corrupt. Can you submit both files to virustotal and provide the links here for me? the one on the flash drive and the one showing that it is corrupt. Here's both files. Wondering if the first one isn't corrupt how can I get mt sfc scannow back in working order? I haven't replaced the file yet with the other one now that you are saying it is okay. The files are exactly the same. I will look over the log but its nothing to worry about. Its definitely not corrupt. It wont affect the os in any way as the correct file is present and not corrupt. Can you pm me the full cbs.log? You can possibly try this program. I have never used it. It looks like it uses the dism tool to repair stuff sfc cant. I recommend backing up the system before hand just in case. And let me know all the locations its found. Hi there. CBS log sent, I used the sfcfix tool prior to posting here on the forum and the results were good..no errors but it didn't fix my sfc scannow issue so kind of a double edged sword . Thank you so much for the link tho. Here is an attachment with the locations of the dll files..one is the file I added from my flash drive with the (2) on it and the most recent one is the one I brought out of quarantine on the 1/11/19. I went ahead and added the file from the flash in the SySWOW folder but I didn't have any changes. Hopeful something can be done to get my sfc snannow back to normal. Hope you are having a great weekend. Thanks for your help too! I put the other files in virus total and they detected virus on first one and the others were okay..I already uploaded the other 2 files I have. ok do you know where the first one was located? the first vt result before this post. This is a corrupt one. my bet is its in the winsxswow64 120kb one. Bingo..sure is that one. Second one from the top on the pic I last posted with all the iasrecst.dll files. What should one do about this then? I've found the exact same thing - should I replace it, delete it...? Ok replacing this file is not that easy. Everyone but trusted installer only has read access to it. Let me check around and with dev if we can come up with something to make this easier to replace. One way that may work is an offline linux rescue disk.